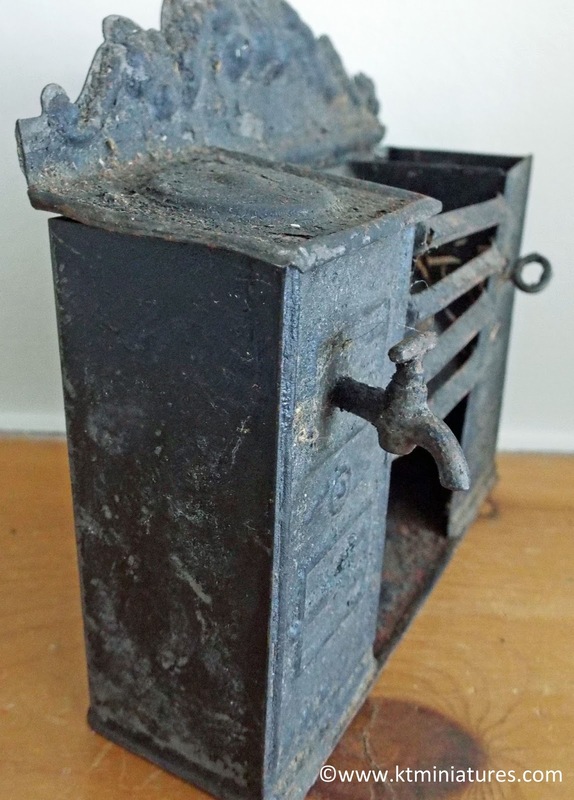 Rare Evans & Cartwright Metal Miniatures Plus Other Antique German Tiny Treasures. 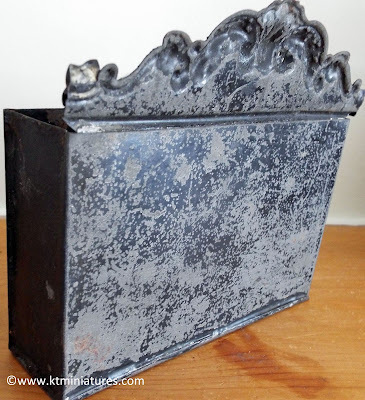 It is rare to come across any circa 1800s Evans & Cartwright metal items these days, but just recently not just one but two "E&C" pieces came in. Both were snapped up pretty quick unsurprisingly, but I thought I would still highlight them on here. 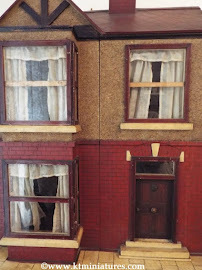 Just briefly, Evans & Cartwright were a British toy company based in Wolverhampton. The company started in 1816 originally by John Evans, then he was joined later by his stepson Sidney Cartwright. They built up the business together until Sidney then took over in 1842, and eventually the company ceased around 1870 - 1880. 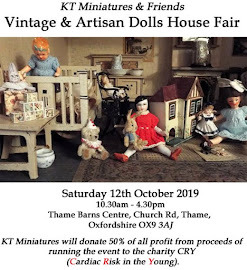 For a full in depth history of this company, see page 124-129 of Liza Antrim's wonderful book "Family Dolls' Houses Of The 18th & 19th Centuries". 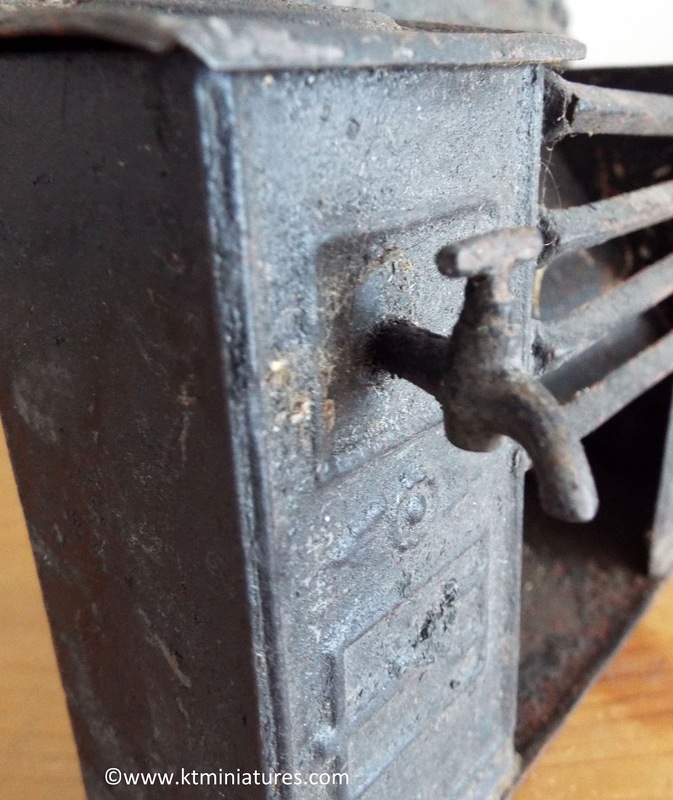 This is believed to be a rare circa 1800s Evans & Cartwright metal cooking range. It measures 5 3/8″ wide x 1 1/2″ deep x 5″ high. So quite large in scale. It still has the original tap fixed to the left hand side. 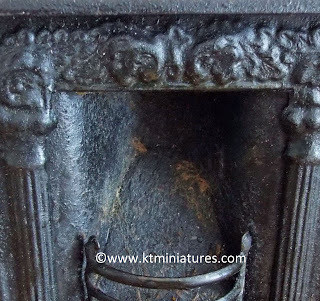 The embossed detail gives you a sense of the detail found on a real life size Victorian range....absolutely super! As you can see from the photo above, the top right hand plate cover is missing. 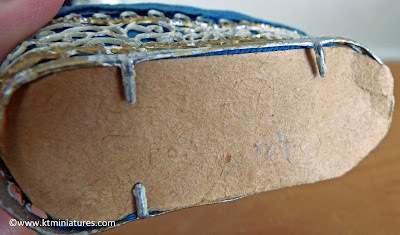 So too, a tiny edge piece of the left back decorative corner, which has long been snapped off. 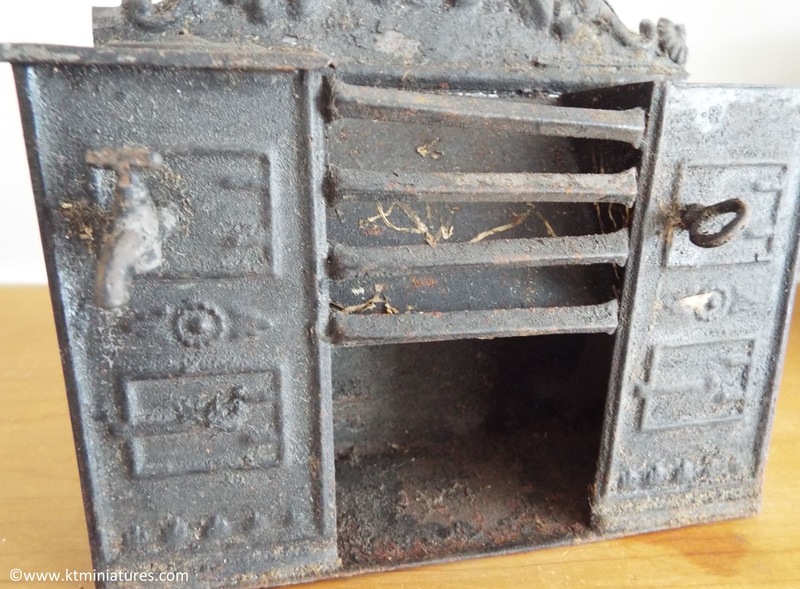 But to be honest, other than a little rust, this is in a reasonably good condition. .
A range exactly like this appears on page 129 of Liza Antrim’s FAMILY DOLLS HOUSES. A wonderful piece of history. 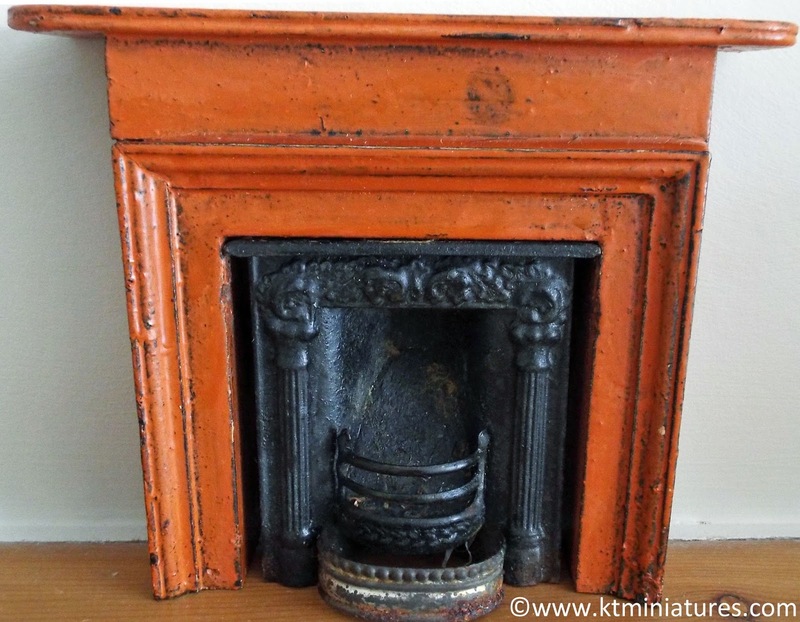 This is believed to be a circa 1800s Evans & Cartwright metal fireplace with an additional wooden painted fire surround of unknown make. 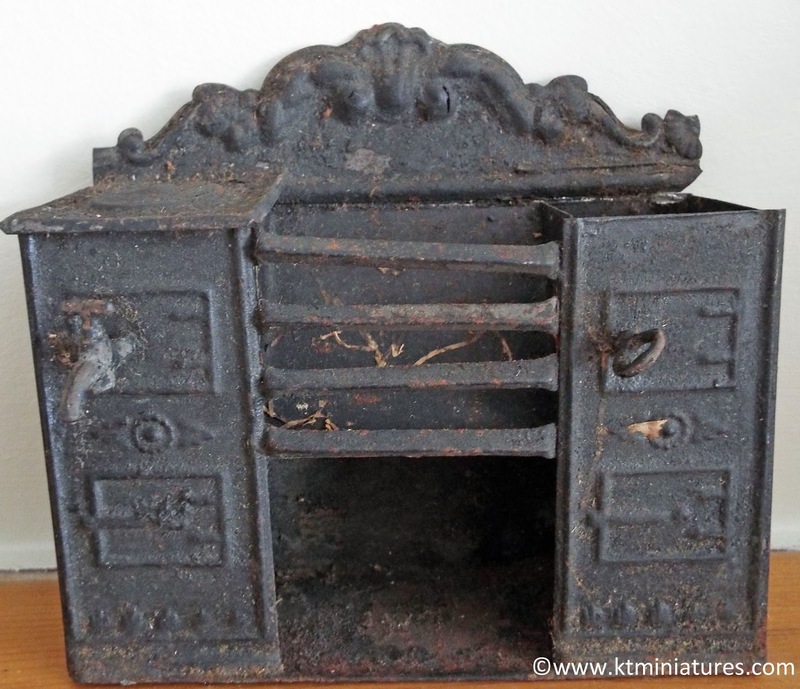 A metal fireplace similar to this appears on page 129 of Liza Antrim's FAMILY DOLLS HOUSES. The metal fireplace itself is all there, including the gilt metal fire fret. The decorative detail is quite ornate, and apart from a little rust and wear, this is in relatively good played with condition. The wooden fire surround is a glorious ochre painted colour, sadly the maker is unknown. 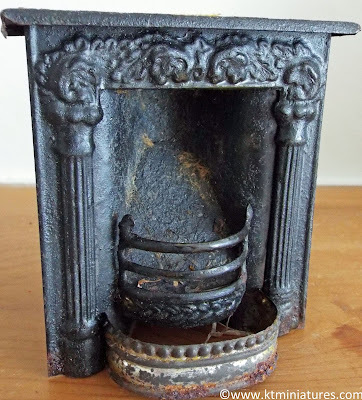 The metal fireplace slots neatly into the surround and I assume that the surround is of the same age as the E&C fireplace. For reference, the metal fireplace measures 3 1/8" at widest point x 3 3/8" high x 1 3/4" overall depth. 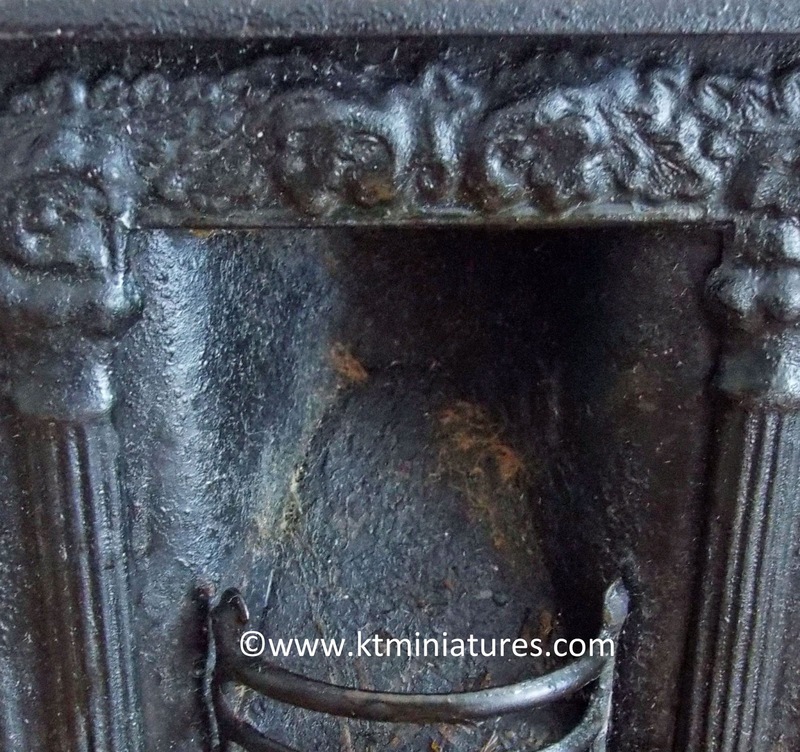 Fire surround measures 6 1/4" widest point x 5 1/4" high x 1 3/4" depth. Below are two other rare German miniature treasures from the same collection and which have also been sold, but because they rarely come along I thought I would show you them on here. 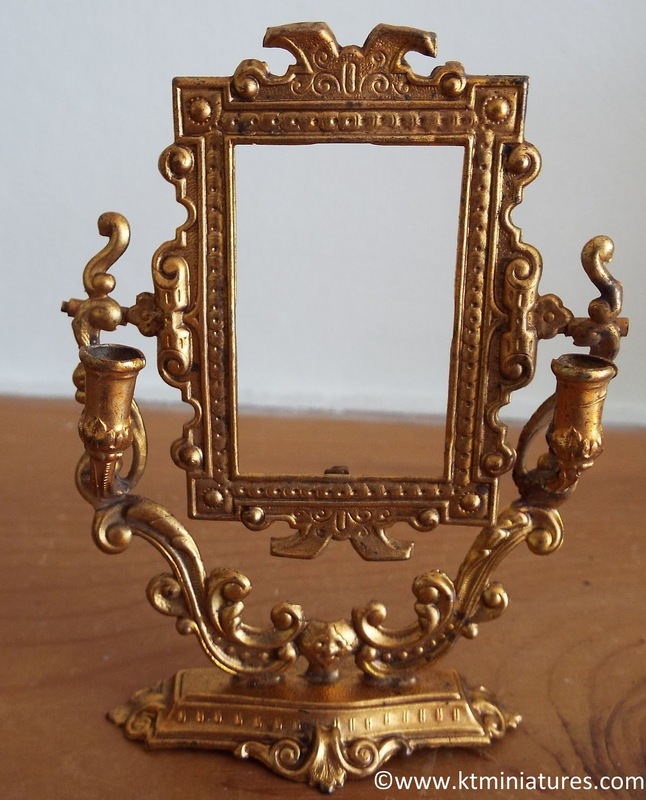 This is an antique gilt coloured metal mirror frame, rather ornate in design along with two candle holders – one each side of mirror frame. 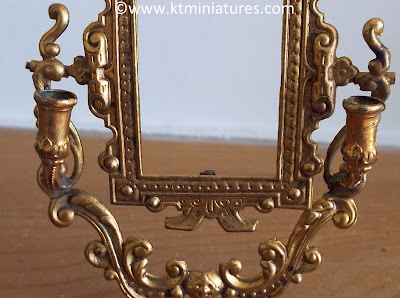 The original mirror is missing but as the original rear mirror fitting tabs are still present and intact, it should not be too difficult to fit a replacement mirror. 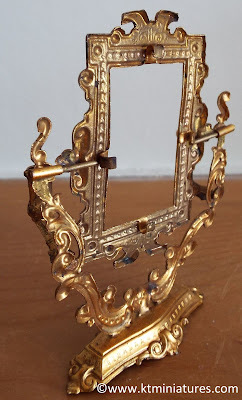 Apart from the missing mirror, this is in a good played with condition. 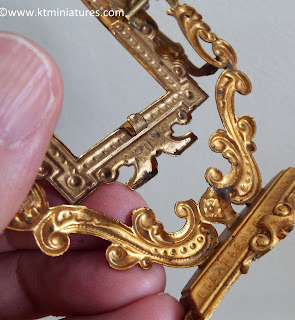 For reference, this measures 3 1/2″ high x 2 1/2″ overall width, and it appears on page 36 of Swantje-Koehler-Verlag’s ORMOLU DOLLHOUSE ACCESSORIES. This is unusual and delightful. I have never seen or handled one quite like it before so I think I can describe this as being rare. 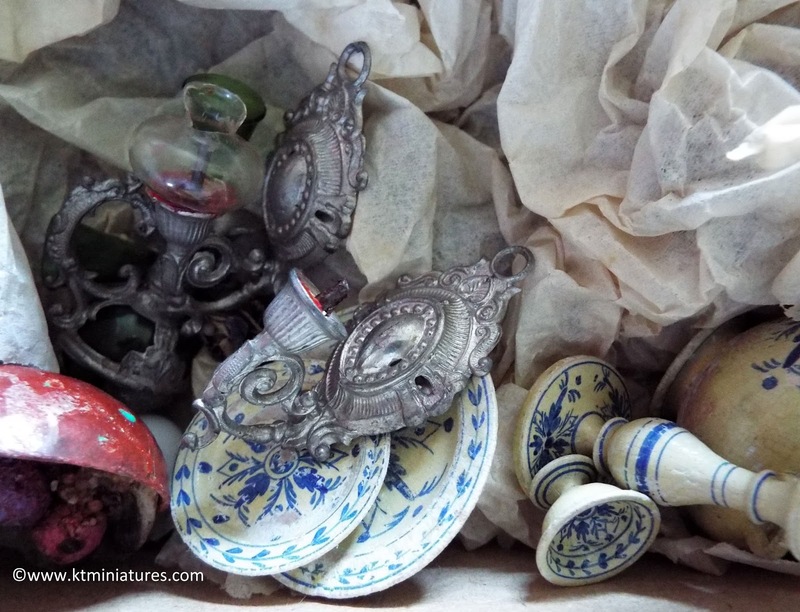 As it came with the collection of items dating from the mid 1800s to early 1900s, I have to assume that it will be of the same era. The frame is of soft filigree metal and has been lined with blue material. 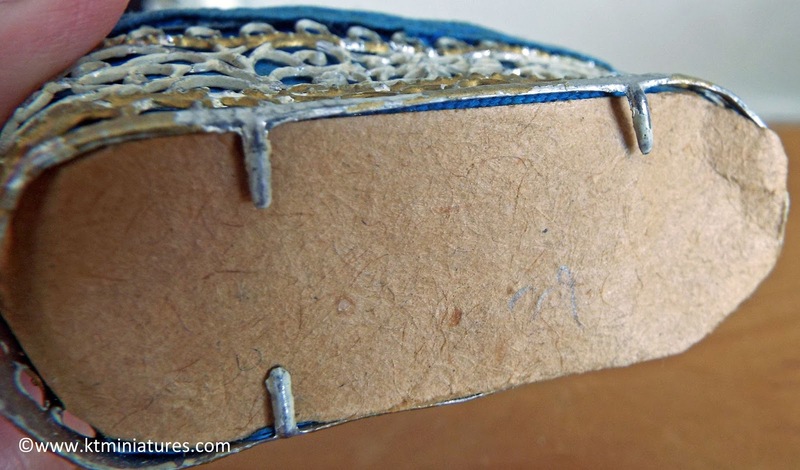 The underside is lined with brown paper of some kind. Overall this is in a good played with condition, just some minor loss of gilt colour around the filigree borders. 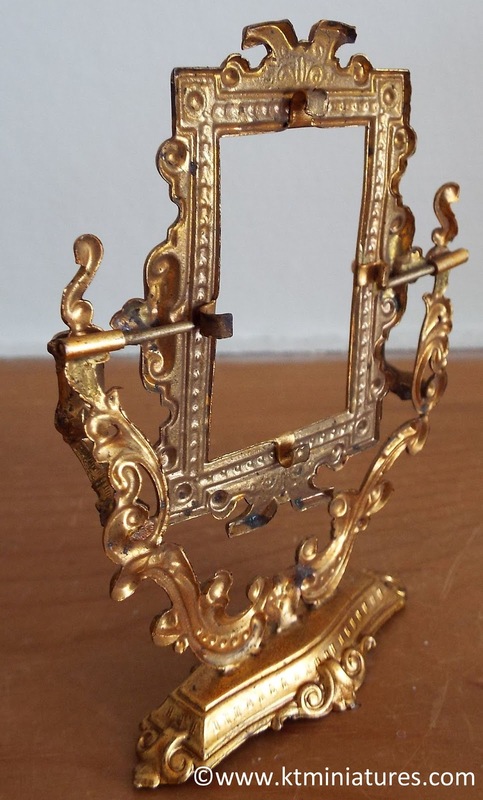 What a wonderful item! 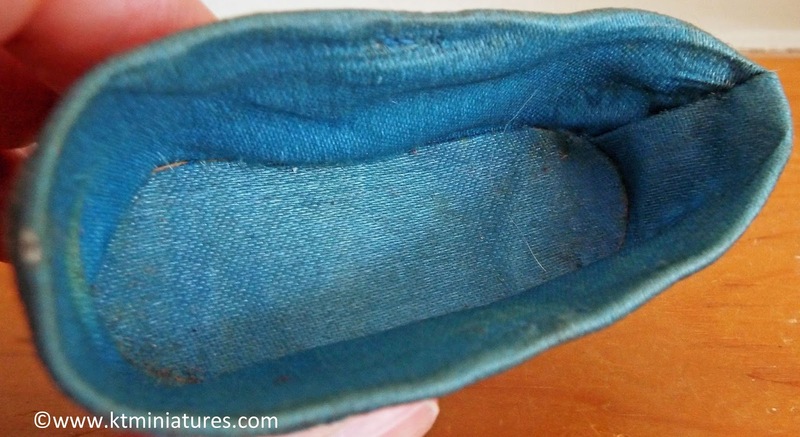 For reference, it measures 2 3/4″ long x 1 1/4″ at highest point x 1 1/4″ wide. More antique treasures from this same collection will be going up for sale this week. My goodness....has it really been a month since I last put up a post on here? 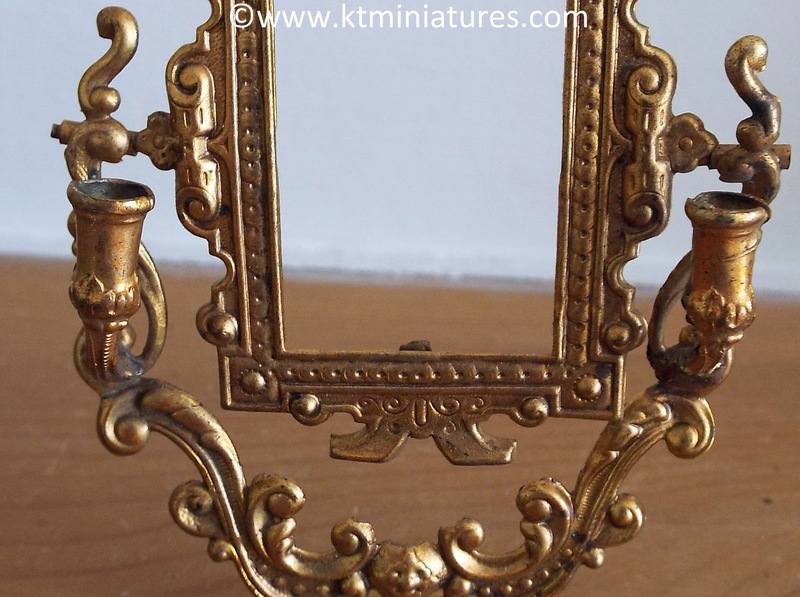 Well, if you are wondering why KT Miniatures has been so quiet, there has been a lot going on here and mostly rather nice. For starters of course, I have been undertaking "Grandma Duties" which I am enjoying thoroughly. Plus I have also been away at least three times during the past month, not all holdidays may I point out :) Then there is the ongoing task of shifting my workroom/studio down two flights of stairs to Mr KT's and my old computer room/office. After scraping all the old wallpaper off, my builder/decorator friend Gordon then did all the papering and painting for me, as there were nasty cracks and issues that needed a professional to sort out. 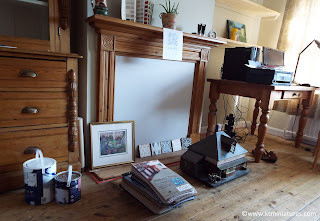 There are still a few things to be done - such as tiling the boarded up fireplace and getting a carpet. 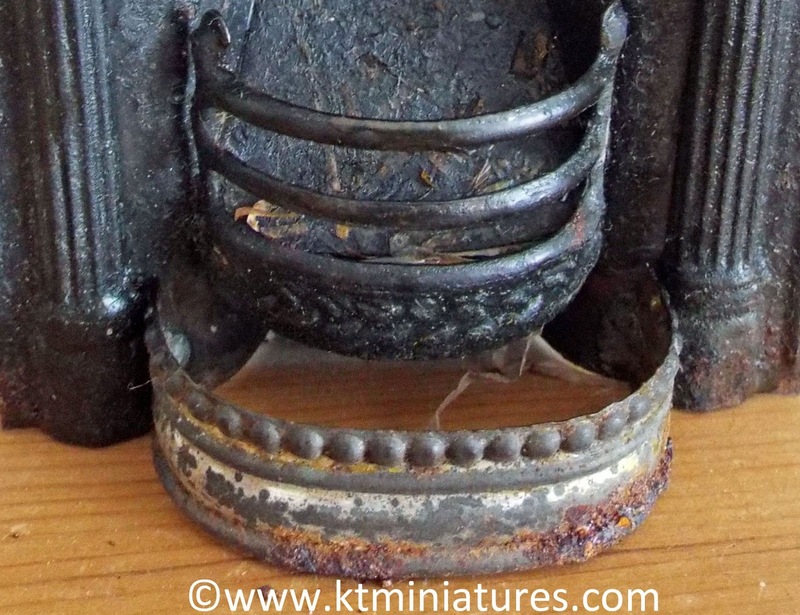 After much deliberaton, I decided against stripping floorboards as they are the open ones and not in great condition. I just couldn't face further chaos and mess in stripping, filling board gaps with sawdust and pva, not to mention staining them....so carpet it is. 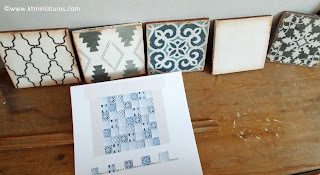 However, I have decided to be arty with the fireplace tiles though and have drawn up a plan with the aid of the computer after having chosen some reasonably priced old looking tiles. I am going for all five patterns from Topps Tiles "Archivo" range. My plan is a random patchwork effect...should be fun. 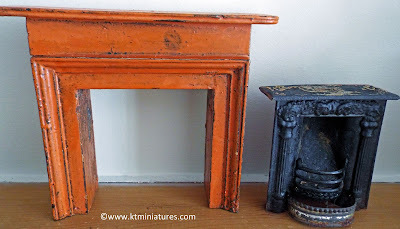 The next decision before the carpet is fitted, is whether to wax the fireplace and newly fitted shelves or paint. Then if the paint option is chosen, what colour should I choose? Decisons, decisions! 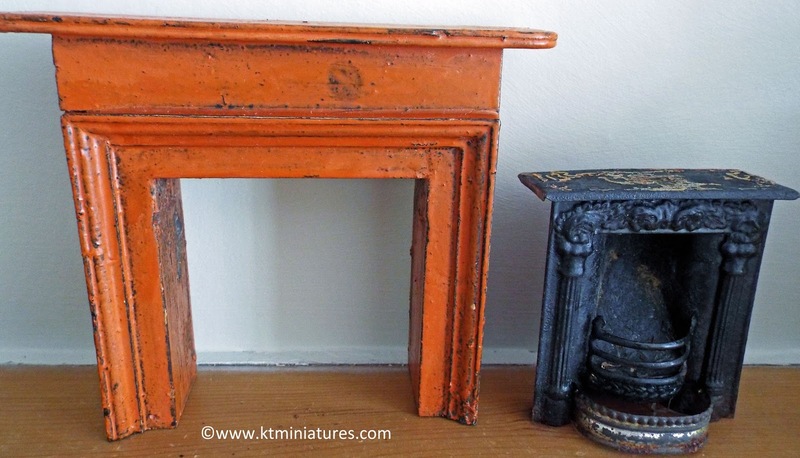 I am moving towards the painted option as I have had that pine fire surround for years and feel I want a change. 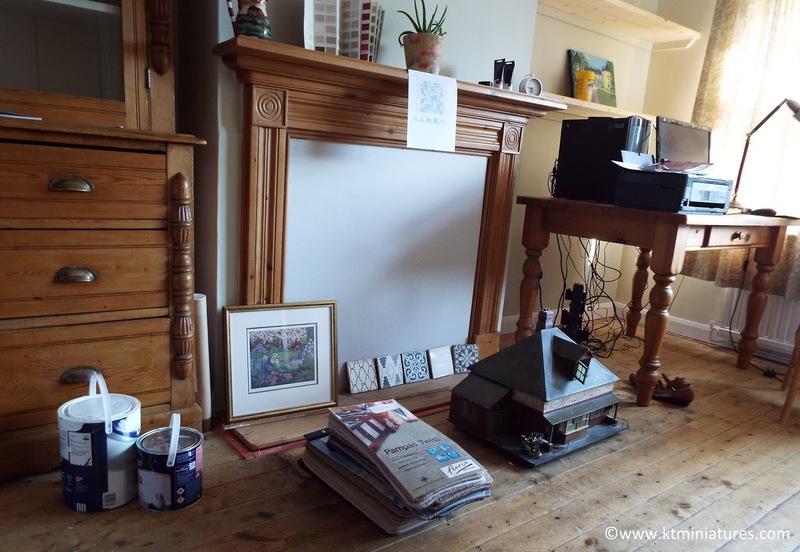 Although have never used eggshell paint before, someone suggested that it would be more hardwearing and a more pleasing effect than satinwood paint. Hmm...we shall see. There are also several boxes of tiny random antique accessories. 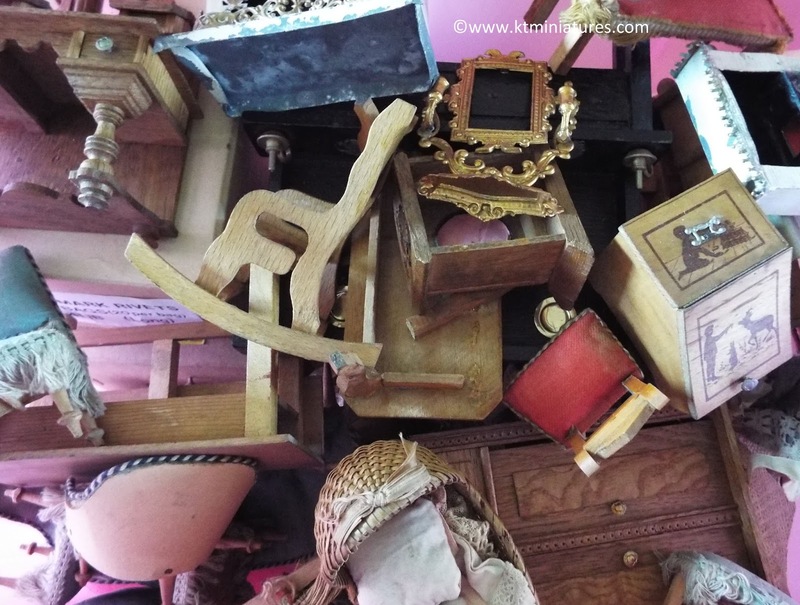 This particular collection belonged to the maternal grandmother of the owner and it is important to her that these go to a good home. 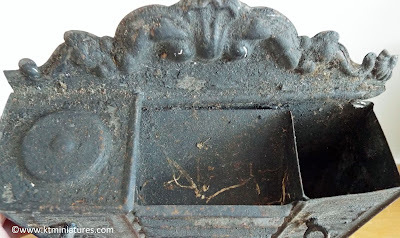 On first inspection they appear to mostly fall into the late 1800s - early 1900s era. 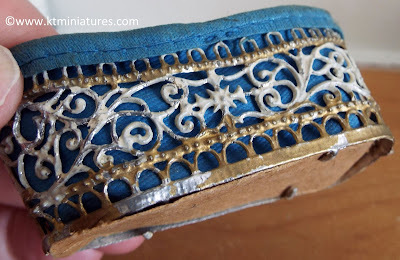 I will endeavour to show some of the more interesting pieces on this Journal over the next few days. 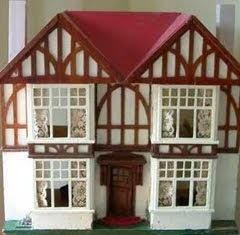 Come see our 1930/40's handmade miniatures plus our large selection of antique/vintage dolls houses etc. My 1930s Hobbies 186 Special! 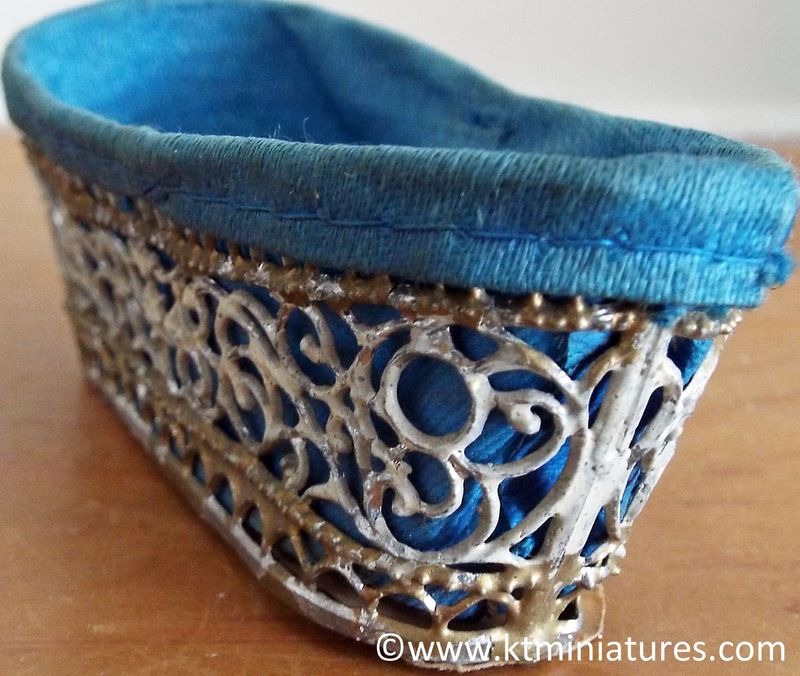 Feel free to enjoy KT Miniatures Journal but please respect my copyright. 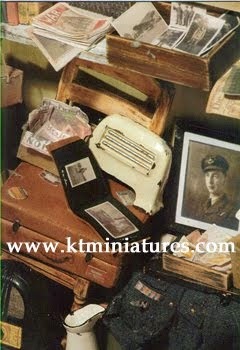 All photos and text on KT Miniatures Journal are protected by copyright and for your personal use only. For any other use, please seek permission. All rights reserved. 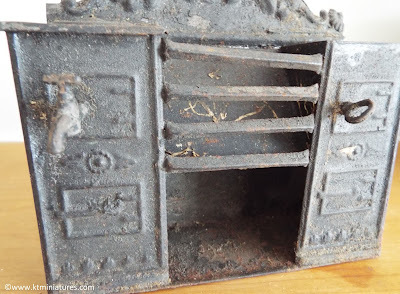 Dolls house destash and spring clean!